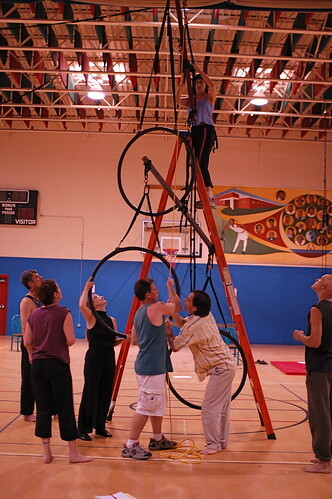 I'm delighted to be talking lessons with the Madison based Cycropia Aerial Dance Troupe. 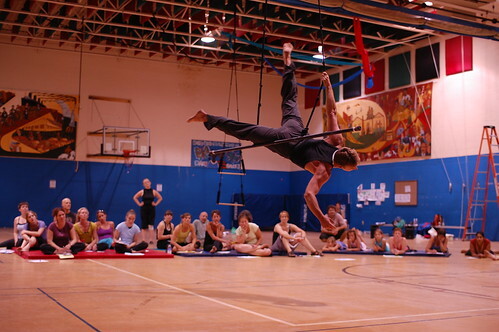 Learning to dance while flying on various ceiling-hung apparatus such as low trapeze, steel bars, hoops, and poles, or "silk" fabric (generally tricot) has definitely been a fun and exciting challenge. I have been fortunate to be able to perform in a couple of their shows, and loved every second of it. Each year in August, Cycropia performs a show at the Orton Park Festival, a show that is amazing, crowd-pleasing, and free. This year is no exception. The setting is outdoors, and the apparatuses used for the perfomance are hung from the limbs of an ancient, sprawling oak tree. (As an aside, Cycropia donates money to vaccinate this tree to prevent Oak blight.) The work that goes into this performance is mind-boggling, and rehearsals are at full-steam for the Aug 22-23 weekend shows. Last Friday night the entire troupe and many of the student flyers met at the Boys and Girls Club gymnasium to have an initial run through of the show. 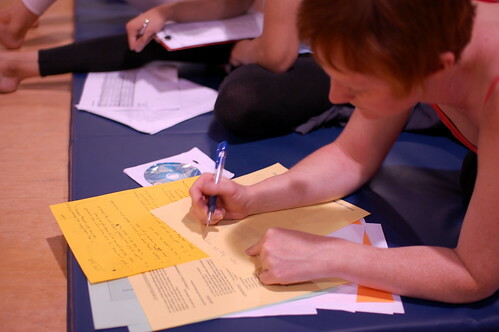 The dancers all performed their works-in-progress for the critical review by the audience of their peers. The goal was to use the trained audience as outside eyes to look for ways to improve the piece, making it stronger and more pleasing to a more naive audience at the festival. My role in this year's show is minor, and I'm enjoying the process immensely. Between each piece, the apparatus used needs to be switched out for another, and that can take several minutes. While necessary, it is not particularly interesting to the audience. To provide entertainment during those transitions, a group of performers (including me) will be dancing or otherwise performing vignettes that help to tie the various pieces into a cohesive theme. Taken individually, the transition performances are akin to the clowns at a rodeo. Taken as a whole during the show, they are a subplot to the story. But oh, the story itself unfolds as a thing of wonder and delight. There are very few people who see the show at Orton who do not walk away thoroughly pleased. What a treat to be part of it! 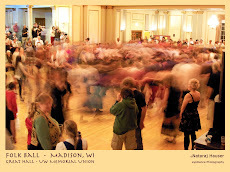 If you are in Madison, or nearby, I urge you to come to the show. You won't be disappointed. Seeing it three years ago is what hooked me.